Not even the staunchest supporters of the Baggy Greens would have imagined that the 2013-14 Ashes would be decided in favour of their team in the first three Tests itself. It has all happened so suddenly – England, who came Down Under on the back of three successive Ashes triumphs, were made to eat humble pie in a defeat reminiscent of their 1990’s travails. It is difficult to pinpoint what went so wrong with the Englishmen. Rather, it has been the Australians who have devoured their rivals with a renewed hunger seen after a long time. England’s weaknesses notwithstanding, Michael Clarke’s men have to be given full credit for scripting probably the most amazing turnaround in Ashes history. The painful memories of the 2010-11 defeat – when they lost a home Ashes for the first time in 24 years – have been well and truly consigned to the dustbin of history. At the start of the first leg of an unusual back-to-back Ashes season in England back in July, Australia were in doldrums. They could not have expected a worse build-up to the series – their coach Mickey Arthur was sacked before the first ball was bowled, they had just come off a humiliating 4-0 whitewash defeat in India, there were reports of in-fighting within the team and the many soothsayers had already given their points of view. The legendary Ian Botham loudly proclaimed that he was confident of a 10-0 victory for England over both the series. Australian experts themselves showed scarce belief in their own team, with most of them writing them off much in advance. But then, Australia finally looked like doing something sensible when they appointed Darren Lehmann, a man who totally understood the Australian cricket culture, as their new coach. A controversial Test at Trent Bridge ended in a 14-run win for the hosts, but Australia had showed they were no pushovers. As the series progressed, England were found wanting on quite a few fronts, and were generally bailed out by the heroics of Ian Bell (hundreds in all three wins) or Stuart Broad (who took 6/50 in the fourth Test to seal the Ashes). England won 3-0, but the story could well have been different. Except for the 347-run thrashing at Lord’s, every other game had a possibility of an Australian win at some point. Yet, to many, England came to Australia in early November as firm favourites to clinch a fourth Ashes series in a row. The selection was criticised a bit – Nick Compton was ignored again, Graham Onions overlooked in spite of being in top form for Durham, Steve Finn was retained and Boyd Rankin too got a place in the 17-man squad. Nevertheless, the seasoned campaigners had every reason to believe that they could vanquish the Aussies again – Alastair Cook, Jonathan Trott, Kevin Pietersen, Matt Prior, Greame Swann, Stuart Broad and James Anderson seemed like enough ammunition. Surely, all of these could not fail collectively at the same time? As the opening day at the Gabba arrived, Australia’s top-order came a cropper again, with Stuart Broad – much-maligned for not walking at a crucial juncture in the Trent Bridge Test – reducing the hosts to 132/6. No one could have foreseen that this was going to be the only day (so far) in the series where England could have said to have an upper hand. From Day 2, it all began to go downhill. 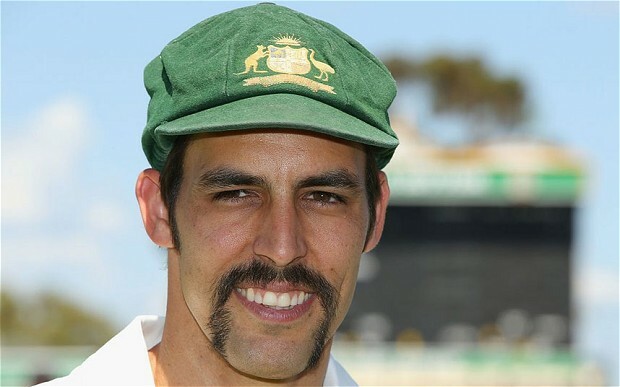 England’s batsmen ran into Mitchell Johnson. Yes, the same Johnson of ‘He bowls to the left, He bowls to the right, That Mitchell Johnson, His bowling is shite’ fame. Having been recalled to the Test team after a string of quality spells in the ODI’s in India, Johnson’s spell on the second day at the Gabba sowed the seeds of apprehension in the English batsmen’s minds. His 4/61 might not have looked sensational, but the way he bowled set the tone for what was to come. Set 561 to win, England folded for 179 with Johnson taking 5 more for 42. Ahead of the second Test, Trott headed back home due to stress issues, dealing a blow to the tourists’ already-low morale. The low point certainly came in the second Test at Adelaide, where Johnson embarrassed the Ashes holders with a ruthless display of fast bowling on a supposed belter. His 7/40 in the first innings was surely one of the best spells in recent times. Yet another big defeat, this time by 218 runs. It looked as if England had altogether given up on fighting back. Indeed, history too was against them, as no team had come back to win a 5-Test series after being two down since 1936-37. Australia arrived at the WACA smelling blood and another thrashing loomed large for England on what is known to be the world’s bounciest pitch. Though the pitch did not behave the way it was expected to, the pattern of play as it unfolded was almost the same. After squandering a chance to shut out Australia on the first day, when the hosts were 143/5, England gifted the game away on Days 2 and 3 – first with a below-par bowling performance which allowed Australia to reach 385 (Steven Smith getting a fine hundred), and then collapsing from 190/4 to 251 all out. David Warner and Shane Watson then further buried the beleaguered visitors, reeling off hundreds at breakneck speed, sharing 28 fours and 7 sixes between them. As if this was not enough, England’s pace spearhead Anderson was clobbered for a record-equalling 28 off an over by three-Test old George Bailey. The humiliation was complete. England then stared at their third successive 500+ target, and the margin of defeat was reduced to 150 thanks only to young Ben Stokes who made England’s first century of the series. 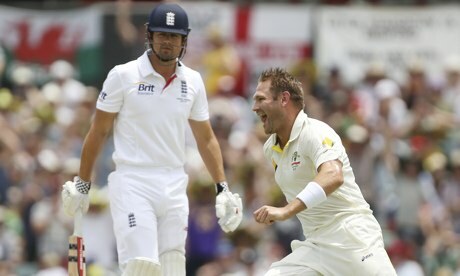 Johnson meanwhile swelled his series wicket tally to 23, with Peter Siddle and Ryan Harris supporting him greatly. England’s sorry surrender was perhaps best typified by the the look on captain Alastair Cook’s face when he was cleaned up by a beauty from Harris off the very first ball of the chase at Perth. Cook, who was in supreme form in the 2010-11 Ashes, has averaged just 25.66 in this series so far and has failed to lead his side by example. That is not to say that the others have stood up – England’s best run scorer thus far has been Ian Bell with 190 runs. Pietersen averages 27.5, Prior 17.83. It has been a collective catastrophe. Contrast that with the Australian numbers in the three Tests – four of them have scored more than 200 runs, with Warner – much maligned in England for his off-field controversies – topping the charts with 457 at 91.40. Skipper Clarke and the ever-dependable wicketkeeper Brad Haddin have made 331 and 325 respectively. 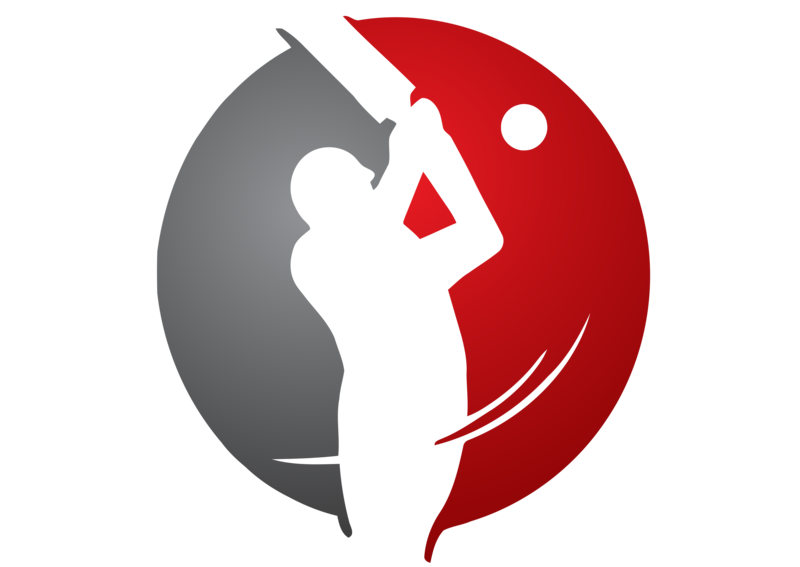 The difference in the teams’ bowling has been even starker – England’s two bowling aces Anderson and Swann have each picked just 7 wickets at averages of 58.42 and 80 respectively. The only saving grace has been Stuart Broad, who has taken 14 scalps at 25.21, and is at the moment second in the list behind the outstanding Johnson. Nathan Lyon has out-bowled Swann by a distance, and has done enough to be retained as Australia’s first-choice spinner in the future. As I write this, news of Greame Swann’s immediate retirement – from all international and first-class cricket – has come in. The 34 year-old has called it a day citing his inability to bowl in the five-day game any longer. His final career statistics are 255 wickets at 29.96 in 60 Tests. The big dilemma for England will be to find a decent spinner to replace the void. Monty Panesar has been unimpressive of late, and so has been Simon Kerrigan. With Trott too unlikely to return, England have lost two of their most consistent performers of the last five years on this doomed tour. On the other hand, besides their excellent bowling feats, Australia have found batting saviours at vital points in all three Tests. At Brisbane, Haddin and Johnson steered the team to safety after the opening day collapse before the Aussie bowlers ran riot. At Adelaide, Clarke and Haddin put on 200 for the 5th wicket to put the first-innings total beyond England’s reach. At Perth, it was Smith and again, Haddin, who made England pay for a poor fielding performance on the first day. As it seems to me, Australia’s worst is clearly behind them and their three-Test tour to South Africa in March will be a great battle to watch. The Ashes might be sealed, but the traditional Boxing Day and New Year’s Tests are still to be played. The last time Australia held the urn was in 2006-07, when they won 5-0 and when they were world-beaters. A similarly comprehensive series victory cannot be ruled out if the first three Tests are any evidence. It is up to England whether they wish to show any vestige of a fight and salvage some pride. Meanwhile, a certain Glenn McGrath has (again) predicted the final scoreline. No prizes for guessing what it is.